Sephiroth, the super soldier and main antagonist in the 1997 role-playing video game Final Fantasy VII, is apparently hailed as a transgender icon, according to an article by trans gamer Diana Tourjée. That’s because Sephiroth doesn’t feel like other humans (he’s part alien) and because he starts using a gender-neutral pronoun after he burns down a village. But while many other queer gamers also see Sephiroth as trans, the villain doesn’t self-identify as such in the game. So we dug around to find five trans video game characters who are openly trans or gender-nonconforming. What’s most interesting about the list below is that it shows representational progress. The earliest trans video game characters were villains — like Birdo, the egg-shooting mini-boss from the 1988 Nintendo game Super Mario Brothers 2, and Poison, the transgender baddie from the 1989 Capcom game Final Fight. But unless you knew these characters’ backstories, you couldn’t tell they were trans. Even a more recent game like 1998’s Legend of Zelda: Ocarina of Time presented its gender-nonconforming character, Sheik, as ambiguous or agender rather than explicitly trans (before we discovered Sheik was a persona of Princess Zelda). And later on, in the 2017 game Legend of Zelda: Breath of the Wild, a trans character is a non-playable female-identifying person whose beard is momentarily revealed as a joke. While we still don’t have trans video game characters playing the lead in mainstream projects, they’ve at least started to appear as playable characters and side characters treated respectfully by their developers. Check out this list of trans video game characters below, illustrating an evolution in representation. In this time-hopping role playing game, you encounter Flea as a powerful magical enemy during the Middle Ages. 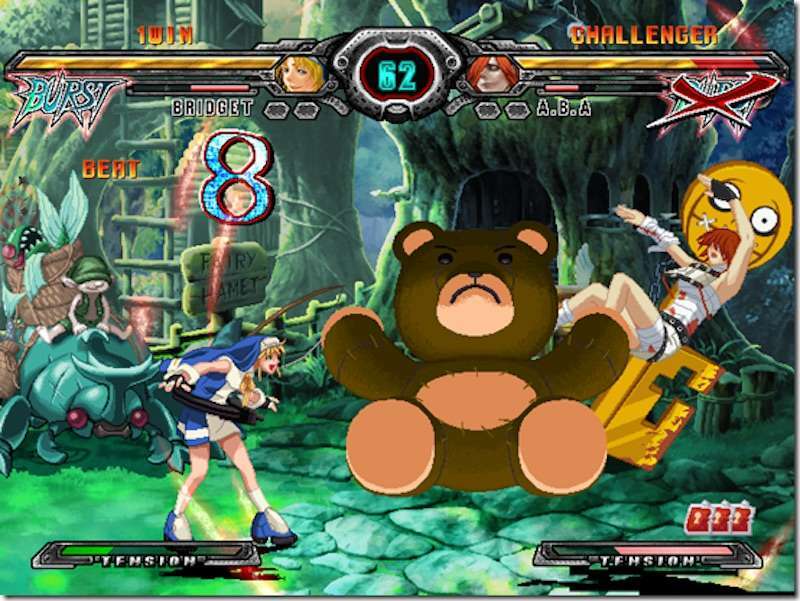 Despite having prominent breasts, long pink hair, a skirt and a magical bustier you can steal, the game identifies Flea as male. 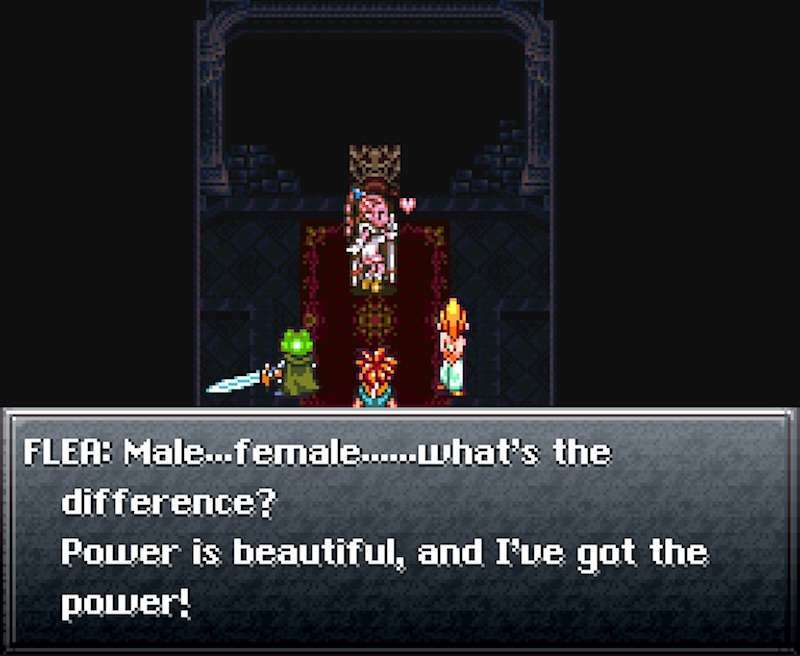 The game also gives him an empowering line of dialogue (above) in which he proclaims his androgynous beauty and he’s one of the harder bosses in the game, even seducing members of your own party to turn against you. Let us clarify: Bridget doesn’t self-identify as trans, but the character’s story is complicated. He’s a self-identified boy who was raised as a twin in an English village that believed it was bad luck to have twins of the same gender. Unwilling to sacrifice or exile their male child, Bridget’s parents raised him as a girl, giving him a top-quality education to make up for the deceit. Bridget grew up to become an androgynous and massively talented bounty hunter, dressed in a nun’s garb with long blond hair, a high-pitched voice and clunky lobster heel shoes. He fights using a yo-yo and his ever-helpful teddy bear with the goal of eventually earning so much money that he can return to his parents’ village, reveal his true gender and show the villagers their superstition about twins is silly. 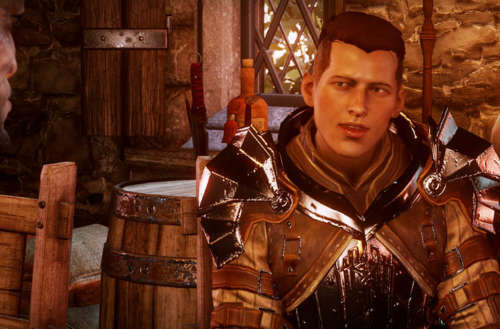 Krem, the second-in-command of a mercenary company, has been called the best of all trans video game characters so far. He’s a non-playable character, but his backstory is pretty amazing. 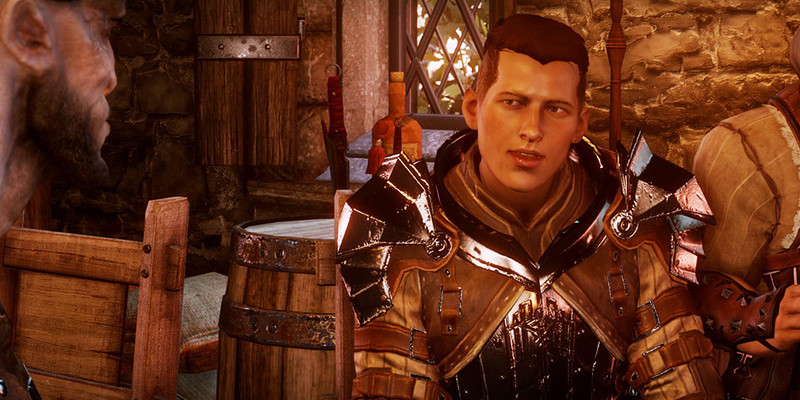 Despite being assigned female at birth, Krem used to pretend to shave alongside his dad as a child. As a grown up, he hid his trans identity and paid off a medical examiner to join the all-male military so he could keep his family out of poverty. Because falsifying military records is a capitol offense, he had to flee when his trans identity was discovered. But he was rescued by the leader of the mercenary group he currently works for. 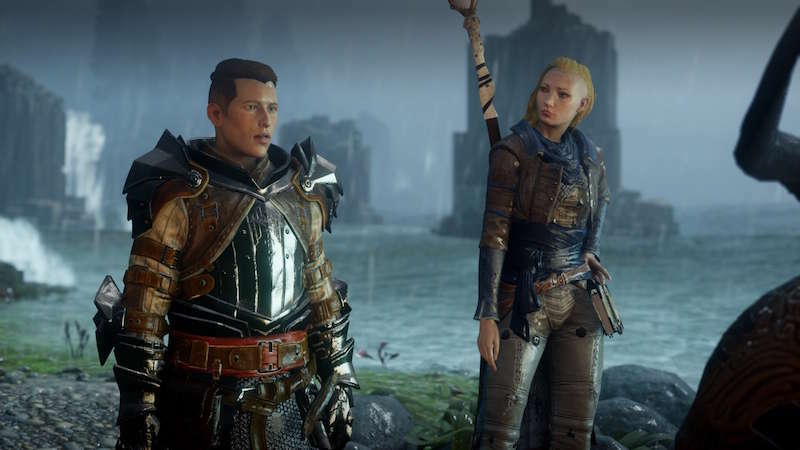 Although Krem is voiced by a cisgender female voice actor, his developers had genderqueer friends read over his backstory to ensure that he was a positive, non-triggering representation of openly trans video game characters. 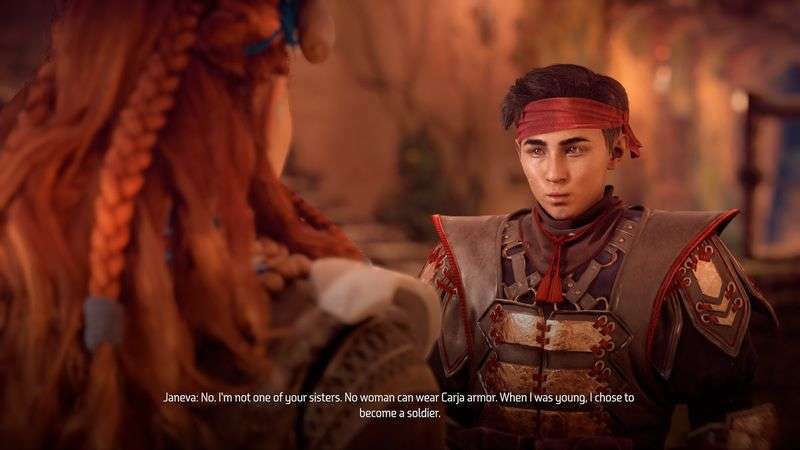 Although Janeva doesn’t identify as trans, he rejects being referred to as a “sister” of other women and mentions that no women can wear the armor of the Carja army like he does. On the road towards his lifelong desire to become a soldier, he broke the arm of anyone who tried to say that he wasn’t male — that shut them up. Now he has become the warden of a prison at Sunstone Rock and sends the game’s hero (you) on a sidequest to kill three escaped prisoners. While it’s unfortunate that Janeva had to conform to violent male stereotypes to achieve his life’s dream, he politely corrects any player who tries to assign him female pronouns and he also can be used as an ally in the game’s final battle, which is pretty significant. Abrams serves as the scientific director of a newly established human colony in the Andromeda Galaxy during the year 2185. She tasks the player with helping her measure earthquake activity on the outpost town of Podromos to improve irrigation there. If you complete that mission, she reveals more about her backstory and asks you to have her fiancé released from cryogenic sleep. When the game developer BioWare first introduced this trans character, trans gamers complained about her awkward and unrealistic portrayal. It used to be that she revealed her trans identity and her deadname (the name assigned to her at birth) upon meeting the player, something few (if any) trans people would actually do. 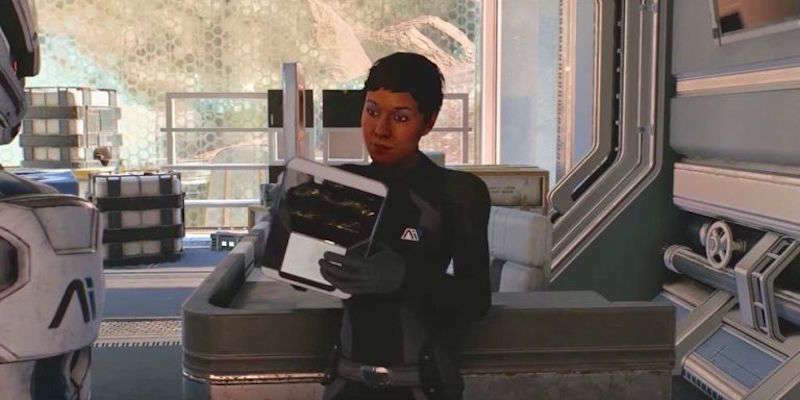 BioWare apologized and updated the character’s script to reveal this information only after the player earns her trust. Who is your favorite on our list of trans video game characters? Did we leave fail to mention any of your favorite trans video game characters?